America, when we travel to America or mention about United States, there is a famous statue as main topic to communicate. It should be Statue of liberty. Certainly, in United States there are so many miracles and wonders as historical relic, however statue of liberty is more representative during many of wonders. The full name of the Statue of Liberty is the “Statue of Liberty National Monument”. The official name is Liberty Enlightening the World. It is located near the estuary of Hudson river of Liberty Island in New York Harbor. The statue of liberty wears an ancient Greek costume and wears a radiant crown on her head. The seven of outshoot on the crown symbolize the seven continents. The right hand holds the torch of symbolizing freedom, holding a nameplate in the another hand and date of the declaration of independence was carved on it. Under the feet are broken handcuffs, fetters and chains, symbolizing the freedom and freedom of breaking away from tyranny. The Statue of Liberty is the symbol of the United States, the symbol of friendship between the American nation and the American people, and the expression of the lofty ideals of the American people for democracy and freedom. Meanwhile freedom is the symbol of the United States. In 1984, the Statue of Liberty National Monument was listed in the World Heritage List. Statue of Liberty is France’s 100th anniversary gift to the United States in 1876. 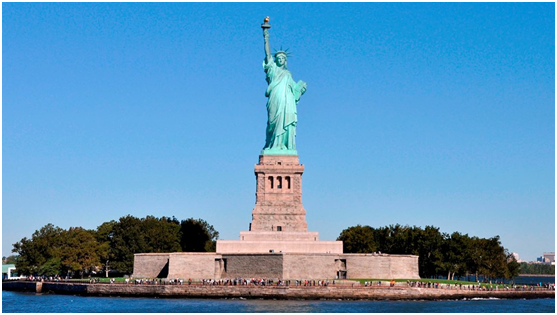 The Statue of Liberty in the United States is based on the Statue of Liberty in the Paris-Luxembourg Park in France. The famous French sculptor Bartholdi, Frederic-Auguste completed the sculpture after 10 years of hard work. It was completed in May 1884 and shipped to New York in June 1885. In October 1886, Stephen Cleveland, President of the United States, personally presided over the opening ceremony in New York. The base of the Statue of Liberty was built by the famous Joseph Pulitzer who raised $100,000. The base is a museum of American immigration history. When the statue was shipped to New York, because the Statue of Liberty is just around the route, all visitors and passengers entering and leaving the port can see it. When the ship entered the New York bay, due to the curvature of the sea, passengers on board could not see the tall buildings in New York City, but the first thing they saw was the huge statue of liberty.